Club Penguin Cheats by Mimo777 Club Penguin Cheats by Mimo777: Club Penguin What's New Membership Page! i think tht it will be the same as the Box Dimension it can't be charted! Guess what Mimo777!!??! I found a cheat! 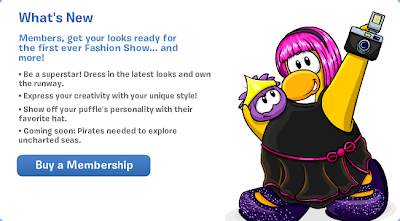 1.Go to the "Upgrade Igloo" catalog. 2.Go to pg. 2. Click the crowbar at the top of where it says "Floor Removal Service". looks more like a penguin wearing a wig and showing it's armpits. Penguins are bald crazy disney. Also, think about the boys! Oh please cancel this! It would be more of a true nightmare when the rooms are decorated! Thank goodness I can go and stay at the migrator or if there is a chance rockhopper island while that fashion show is on. I might even live there because of cp going downhill! Yeah! Maybe the 'sail out of the island in a boat' stamp will be available again! Hey, mimo. Just thought I'd let you know. If you go to any dojo, it's sideways. If you go in the Ninja Hideout, it's sideways, too. But with the ninja hideout, when you try to use the gongs, or open the doors, it doesn't make the correct noise. i think the penguins outfit there will be in the catalog! Man! My membership has to expire RIGHT now.... :( I need to get more membership!! i just got a 6 month membership last night! Disney, I hope ya pay up with a sonic the hedgehog party! This is for the boys also, and it will not be for members-only! Yo got me? Also, it will most definetley happen with nothing ruined! It's nice they're doing something for the girls. So much is for boys or you have to look like a boy to do stuff. EPF and ninja stuff and a lot of the special dances is all boys. mimo how come you always post comment trackers just before the party ends? ever wander how some ppl got silver surfboards? well now u can get one ur own! 2: click on the word WAVES on the top of the page. there u have it! it costs 800 coins and makes u go fast! You notice how in a server theres a green ring around your friend? Disney's world of cars online is sadly closing. Go check it out! Yeah ikr im happy they did something for the girls and boys should just live with it it's only ONE room not the full island if it was the yeah I wouldn't mind as much but it's ONE room.